Ready to laugh? Then you're ready for these dog jokes and funny dog stories. 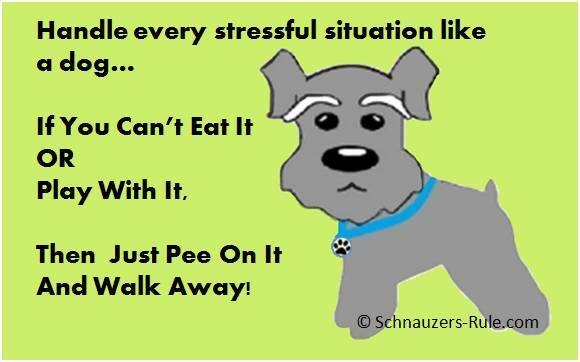 Our Miniature Schnauzers bring us so much joy and laughter every single day... whether we are playing with them or just watching them do something silly, our Schnauzers make us laugh. And after all... laughter is the best medicine. 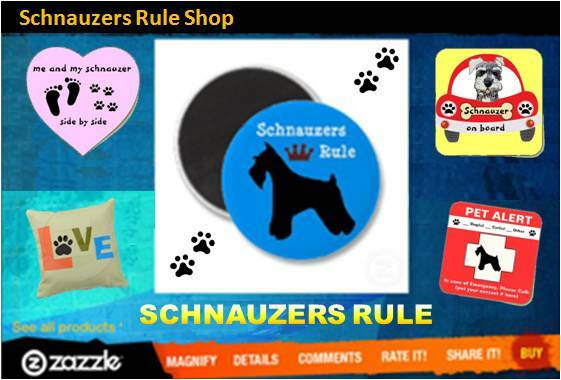 So, in honor of our Miniature Schnauzers and all dogs around the world, sit back and enjoy some dog jokes & stories about dogs and the funny things they do. Be sure and share them with family & friends! And keep smiling. • Dog or Cat? Which Do You Prefer? What do you get when you cross a Sheepdog with a rose? (Answer) A Collie - Flower!!! You know you've waited too long to find a mate when... You think stripping is something you do when grooming your Mini Schnauzer. A guy walking his Chihuahua sees another man entering a bar with his Golden Lab & overhears the bartender say........ "You can't bring that dog in here!" 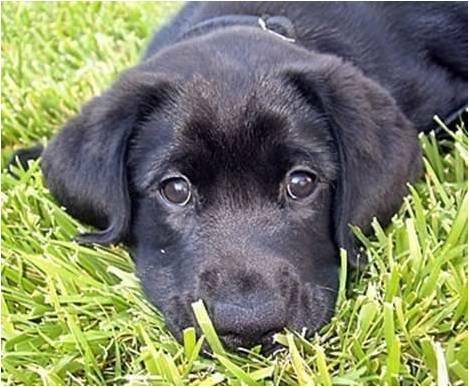 The man quickly replies... "This is my seeing-eye dog." "Oh man," the bartender says, "I'm sorry. Here, the first drink's on me." The man takes his drink and goes to a table. So the guy watching all this figures he could do that too. So he walks into the bar with his Chihuahua and the bartender says... "Hey, you can't bring that dog in here!" The second man replies... "This is my seeing-eye dog." The bartender answers back... "No, I don't think so. They do not use Chihuahuas as seeing-eye dogs." "WHAT?!?! They gave me a Chihuahua?!?" Agent: What's on top of your house? Agent: What's the outer layer of a tree? Agent: Who was the greatest baseball Player? The agent exclaims: This is ridiculous... And sends them away. When they get outside the dog looks up to his owner and says...... What? Should I have said DiMaggio? There's a man sitting on a park bench and a dog sitting beside him. A stranger passing by asks the man..... "Does your dog bite?" "No" the man answered. So the stranger bends down to pet the dog and the dog bites him! "The thing I hate about obedience school is you learn ALL this stuff you will NEVER use in the real world." Okay, this is a dog joke... ie. don't try this at home. To prove that a dog is truly man's best friend... a husband takes his wife & his dog and locks them both inside the trunk of his car for 30 minutes. When he returns and releases the trunk open, guess who was still happy to see him? Well - it wasn't the wife! LOL! Best SINGLES Ad ever printed! Single Black Female seeks male companionship, ethnicity unimportant. I'm a very good girl who LOVES to play.... I love long walks in the woods, riding in your pickup truck, hunting, camping and fishing trips, cozy winter nights lying by the fire. Candlelight dinners will have me eating out of your hand. I'll be at the front door when you get home from work, wearing only what nature gave me. Call (404) 875-6420 and ask for DAISY. I'll be waiting. Over 15,000 men found themselves talking to the Atlanta Humane Society! Now That's FUNNY! Please note: All dog jokes listed are non-copyrighted material found from the internet. If you have information otherwise, please contact us with the dog joke and correct ownership so that we can either remove it or give proper credit to the author. Thank You. Do you know a funny dog joke? Share it with us!